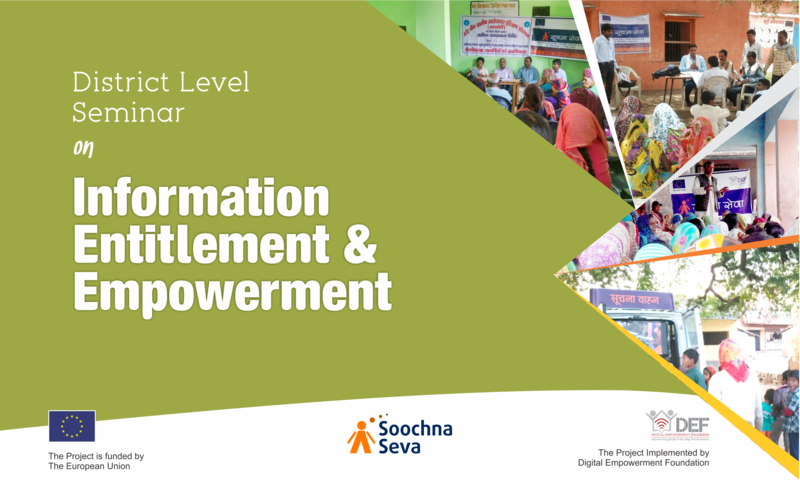 soochnaseva | Visibility Seminars at Barmer, West champaran, Tehri-Garhwal and Guna districts. Information is a tool that can help to eradicate the poverty and backwardness and improve the living conditions of women, Schedule Castes and Tribes, minorities and other marginalized groups. Absence of appropriate mechanisms and limited resources at government level to disseminate important citizen related information has proved hurdle to access the information and derive benefits from public schemes in time. However, this situation can be improved through creating a systematic approach to deliver public schemes information to citizens and communities using both traditional and new methods supported by Information Communication Technology (ICT) tools and platforms. Further, this can be improved through capacity building of the stakeholders in a systematic manner over a period of time. These capacity building initiatives will also play a key role in promoting accountable and responsive panchayats and other government bodies to provision timely and relevant service delivery. All relevant stakeholders including the local administration, the government agencies and departments, the NGOs and civil society organisations and other partners should step ahead and come forward to work in close coordination for improving accessibility of information about public schemes and successfully delivering their benefits to those who are most deserving. The bigger advantage of timely delivery and access of information services helps to stabilise our societies and communities and helps to address their various social, economic and educational Needs. In the longer run, this promotes and strengthens our democracy through active citizen and communication participation and engagement. To understand and take stock of methods, ways and means to deliver public schemes information and provide final entitlements to citizens and communities. To explore new methods, ways and means to deliver public schemes information and provide entitlements through example sharing and exchange. To understand the status and scope for working together between the local administration, government agencies, NGOs and civil societies to improve the information dissemination environment. To work towards a better information democracy in the district and make the district a foremost district in best information dissemination and citizen entitlements in India.